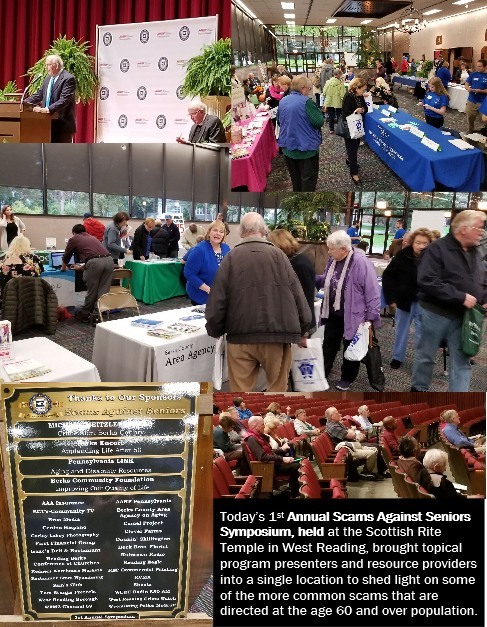 As the Spotlight puts it, “In the shady world of government imposters, the SSA scam may be the new IRS scam.” While reports of SSA imposters have swelled – nearly half of the reports we’ve gotten in the last year have come in the past two months alone – reports of IRS scammers have plunged. What’s more, people told us they lost $19 million to SSA imposters in the past year. That overtakes the $17 million reported lost to IRS imposters in 2016, the peak year of the IRS scam. How can you spot SSA imposters? They often use robocalls to reach you, then launch into a story aimed at tricking you into giving them your money, your Social Security number (SSN), or both. They may say your SSN has been suspended and you need to confirm your SSN to reactivate it. Or, they may say your SSN has been involved in a crime and your bank account is about to be seized or frozen, but you can protect your money if you put it on a gift card and give them the code. Never do that – your money will disappear. If you get one of these calls, remember – the real SSA will nevercontact you out of the blue or tell you to put money on a gift card or, for that matter, visit a Bitcoin ATM, or wire money. If your caller ID shows a number that looks like it belongs to the SSA, don’t trust the number – scammers fake their caller ID all the time. If you’re worried, hang up and call the SSA yourself at 1-800-772-1213. Check out the Data Spotlight for more information. If you think a scammer has your Social Security number, visit IdentityTheft.gov/ssato learn what you can do. “New York artist Jennifer May Reiland’s phone rings all the time. While that gives the impression that she’s a very popular lady, the constant calls she gets aren’t from real people: They’re robocalls or telemarketing algorithms trying to sell her something. While this is a daily annoyance for many, Jennifer’s relationship with robocallers goes even deeper. ‘I work at a bookstore and for a while, I guess robocallers were spoofing our number because we would get multiple calls each day from people demanding angrily, “Why did you just call me?” and when I said we didn’t, they refused to believe me,’ she says. Keep reading this article at OZY.com, click here. “Attorneys general from every state, Puerto Rico and the District of Columbia signed on to an appeal urging Congress to pass legislation cracking down on robocalls and spoofing techniques that trick consumers into answering by making calls appear to come from local numbers. Read this article in its entirety at Route Fifty. “On the internet, you can become anyone you want to – at least for a while. And though deception doesn’t fit well with lasting romance, people lie all the time: Fewer than a third of people in one survey claimed they were always honest in online interactions, and nearly nobody expected others to be truthful. Much of the time, lies are meant to make the person telling them seem better somehow – more attractive, more engaging or otherwise worth getting to know. “‘Catfishing’ is a more advanced effort of digital deception. Named in a 2010 movie that later expanded into an MTV reality series, a catfish is a person who sets up an intentionally fake profile on one or more social network sites, often with the purpose of defrauding or deceiving other users. You can read this article in its entirety at The Conversation, click here. If you’re worried about a call from someone who claims to be from the Social Security Administration, get off the phone. Then call the realSSA at 1-800-772-1213 (TTY 1-800-325-0778). If you’ve spotted a scam, then tell the FTC at ftc.gov/complaint. “Your caller ID might show the SSA’s real phone number (1-800-772-1213), but that’s not the real SSA calling. Computers make it easy to show any number on caller ID. You can’t trust what you see there.” A commenter following this FTC article. 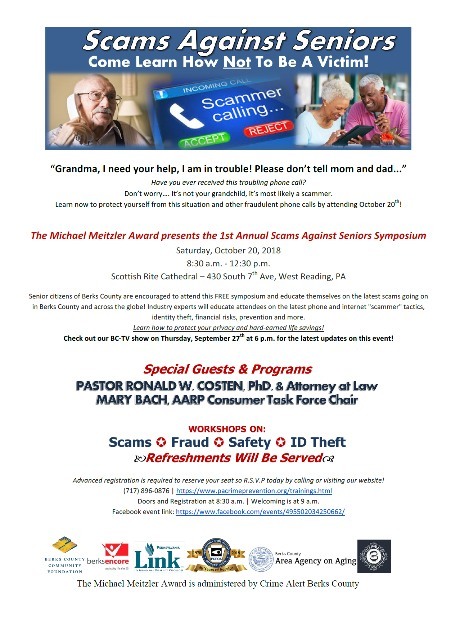 Berks County Link partners’ network co-sponsors “Scams Against Seniors” workshop | A FREE event.